The claim that the atlas was ‘more comprehensive’ seems to be justiﬁed. The 42 county maps are engraved to a high standard. all towns and important villages (including Charmouth), together with roads and rivers. The ‘forked lightning’ effect for rivers persists from 16th and 17th century cartography, as do the ‘molehills’ for uplands. Following a pattern set in the Owen and Bowen maps twenty years earlier, the county title is placed outside the printed border. A compass rose is positioned on the lightly stippled area to the north of the county. A strip of darker shading around the boundary has the effect of throwing the county into relief. The sea, by contrast is completely blank. except for shoreline ripples, a new cartographic convention, which carried on into the 19th century. To the left of each map, within the printed border. there is a wealth of information giving the number of members returned to Parliament (shown with asterisks on the map following John Bayly’s 1773 map) the number of boroughs, market towns and parishes, and market days and fairs, only a handful of which still endure. 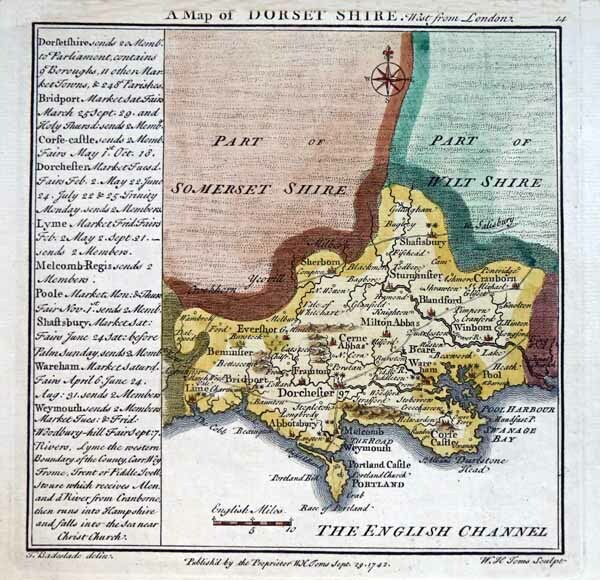 This is probably the first map of the county to show Dorchester’s distance from London alongside its name. However, since a standard length of a mile had not yet been adopted by all map-makers, the 97 miles mentioned is a considerable underestimate compared to the true (google) distance 127 miles.